Patrick Henry College's five beautiful, Williamsburg-style residence halls (three female, two male) are well-equipped to provide students with all the comforts of a full college experience. For security, they are accessible only through access ID cards. Each residence hall is staffed by Resident Assistants (RAs) who provide students with a quality living and learning experience in the residence halls. Two Resident Directors (RDs) oversee the leadership of the RAs, one for the men and one for the women. 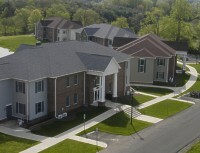 Mount Vernon, Monticello, Montpelier, and Oak Hill are Williamsburg-styled residence halls which began housing students in January of 2001. They are all equipped with two-room suites sharing a common bathroom and each room has its own sink. The larger room in each suite has a maximum occupancy of four residents, and the opposing smaller rooms have a maximum occupancy of three residents. There is a laundry room on each floor, a social lounge on the first, and a study lounge on the second. Mount Vernon is also home to the campus Town Hall, a large assembly space on the lower level. This is the space where daily chapels are held, as well as all dramatic and musical performances. Red Hill is the newest residence hall on campus and began housing men in the Spring of 2003. The rooms in Red Hill each house 2-3 men, with six wings of rooms and a common bathroom in each wing. Red Hill is able to house up to 88 men. There are laundry rooms on each floor and several study and social lounges throughout the building. Take the Virtual Dorm Tour!